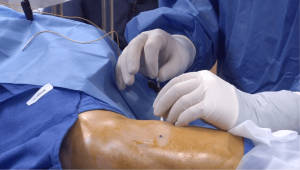 As new devices and technologies specifically designed for peripheral nerve stimulation (PNS) emerge, they promise a number of potential advantages over current PNS devices or SCS devices currently used for PNS applications. One emerging trend is the miniaturization of the PNS system itself. Such devices present several advantages over larger devices, such as decreased trauma from surgery, easier less invasive placement, the lack of extensive tunneling in some patients, and a reduced discomfort from the size and weight of the IPG once it has been implanted. The miniaturization of the device may also make it possible to treat conditions that have been untreated up to the present time because of the disadvantages or difficulties using existing systems. PNS devices are also currently being tested which use leads made from more flexible materials than traditional neurostimulation leads. Lead flexibility may decrease the chance of lead fracture or migration. Several advances in PNS miniaturization or PNS technology have been investigated or are currently being investigated. Some of these include the Bion® implantable neurostimulator device, the Bioness StimRouterTM, the Neuros AltiusTM system, and even non-implantable transcutaneous peripheral nerve stimulator devices like the ElectrocoreTM system. 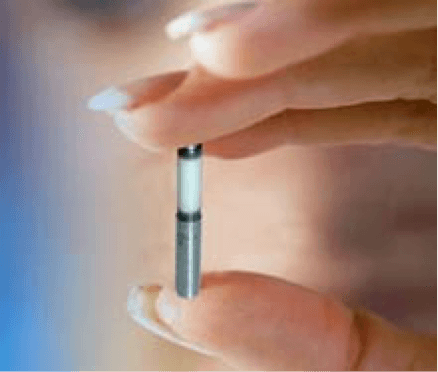 The Boston Scientific Bion is a small cylindrical (27.5 mm long x 3.2 mm wide) implantable neurostimulator (see Figure 1).1 The Bion has been studied in clinical trials as a potential PNS neurostimulation device. This device contains an electrode and a rechargeable lithium ion battery. This device was implanted in the occipital region of nine patients experiencing chronic cluster headache (CCH) that was not adequately relieved by preventative medications (see Figure 2). Of these patients, three completed long term follow up, with two experiencing a reduction of at least 50% in the frequency of cluster headaches at 6 months. The three patients followed up continued to experience benefits 58-67 months after implantation. Figure 1. The Bion implantable neurostimulator device. For investigational use only. Not approved for sale in the US. Figure 2. The implant location of the Bion in the occipital region for the treatment of chronic headaches. In another study, nine patients had the Bion implanted in the occipital region for chronic migraine, hemicranias continua, or cluster headaches.2 Of these patients, eight completed the 12 month follow up with 7 of 8 obtaining fair or better results (at least a 25% reduction) in the reducing their disability. Six patients suffering from hemicrania continua (HC) had the Bion implanted in a crossover study.3 In long term follow up, 4 of 6 patients reported substantial (80% or greater) reduction in pain severity and another reported a 30% reduction. One patient reported a 20% increase in pain. Though these studies examine small numbers of patients without randomization, they appear to demonstrate some promise of small implantable neurostimulators for treating pain, particularly in chronic headache disorders. In addition to evidence of its efficacy, these studies found the Bion to generally be safe. 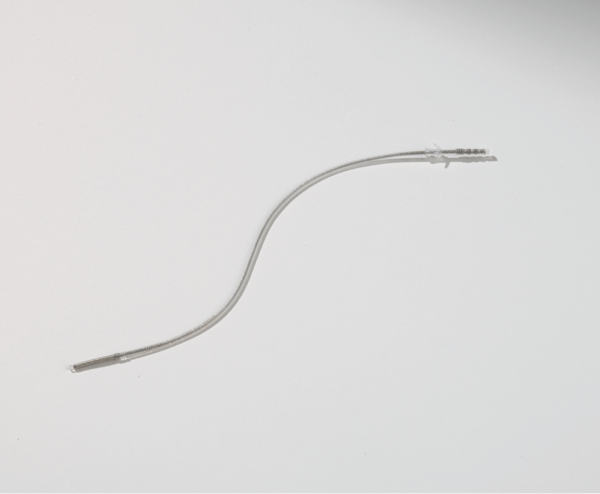 The Bioness StimRouterTM is a single percutaneously inserted lead that has three tightly spaced contacts on its head and a radiofrequency receiver on its tail.4 This device is currently being studied in a clinical trial for post-traumatic or post-surgical neuropathic pain of a single peripheral nerve. A patient wears an external patch that acts as the generator and transmits radiofrequency energy transcutaneously to power the device. The system offers several advantages over existing PNS devices. The device implantation is simple and minimally invasive. The device’s small size avoids the discomfort to the patient of a larger implanted device. The external pulse transmitter avoids the need for an implanted battery and subsequent surgical procedures for battery replacement. Disadvantages may include the relatively small surface area of the active contacts on its head, the fact that a patient must wear an external patch whenever they want the device to be operational, and the possibility of skin erosion from the adhesive of the patch. The StimRouter was tested in an open label study with eight patients suffering from carpal tunnel syndrome and chronic pain despite carpal tunnel release and medication.5 The StimRouter was implanted along the median nerve of eight patients (six patients receiving a single StimRouter and two receiving bilateral device implantations). 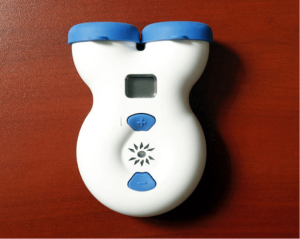 Patients received five days of stimulation with the device, experiencing a mean pain reduction of 37% from baseline on day 5 and reduced their oral opioid medication use while receiving stimulation. No adverse events were reported. Lead: The StimRouter consists of a single 15 cm lead with a body diameter of 1.2 mm. The lead is made from a platinum-iridium alloy covered in silicone tubing. One end of the lead contains a single receiver; the other end contains three stimulating electrodes. The stimulating end also has a four-pronged polypropylene anchor. This anchor helps ensure that the lead stays in place once the device has been implanted. The lead is flexible, making lead migration and fracture less likely. External Pulse Transmitter: The StimRouter lacks an internal pulse generator (IPG). Instead, the device is powered by an external pulse transmitter (EPT). 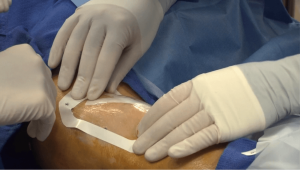 This EPT connects to a disposable patch with an adhesive electrode hydrogel. This user patch must be replaced every 2-3 days. The EPT and patch are placed on the skin over the implanted lead. 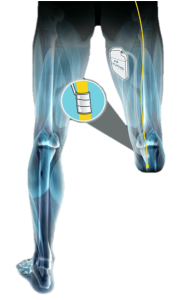 The EPT and user patch transmit transdermal electrical stimulation that is picked up by the lead’s receiver electrode and transmitted through the stimulation electrodes to the target nerve. A rechargeable battery built into the EPT’s case provides power. Patient Programmer: The StimRouter can be turned on or off and the device settings adjusted with a patient programmer. This programmer wirelessly communicates with the EPT. During office visits, a clinician programmer is used to set device parameters for delivering effective stimulation. The patient programmer allows the patient to make finer adjustments to the intensity of the stimulation and to switch between up to eight stimulation programs. The StimRouter is intended to treat patients with peripheral mononeuropathies. These included post-traumatic neuropathies, post-surgical neuropathies, and other neuropathies. Patients who experience moderate to severe chronic pain limited to a single peripheral nerve may be good candidates for this treatment. Patients with appropriate neuropathies may be identified by electromyography (EMG) testing or diagnostic nerve blocks using local anesthetic. 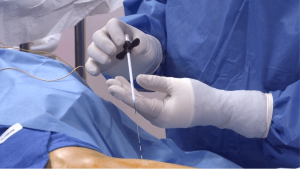 Patients who receive significant temporary relief from a nerve block of a single peripheral nerve may get relief from a peripheral nerve stimulator such as the StimRouter. Figure 3a. The Bioness StimRouter peripheral neurostimulator lead. For investigational use only. Not approved for sale in the US. Figure 3b. The Bioness StimRouter peripheral neurostimulator Electrical Pulse Transmitter (EPT) and electrode patch. For investigational use only. Not approved for sale in the US. The StimRouter lead is implanted in a 30-45 minute outpatient procedure. Conscious sedation is generally used during this procedure. Inserting the stimulation probe. An initial 1 cm incision is made approximately 8-10 cm from the target nerve under local anesthetic. 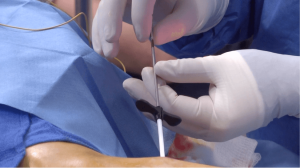 A stimulation probe is inserted into the incision and guided to the nerve. This can be performed under ultrasound guidance. Electrical stimulation is sent through the stimulation probe to test for paresthesia in the area of the patient’s typical pain. Inserting the loader. Once paresthesia is achieved the target area, a loader is inserted over the stimulation probe. Inserting lead into loader. The probe is then removed and the lead is placed inside the loader. The rubber ring on the reed containing the lead is rolled back to expose the electrodes on the lead. The lead is then used to deliver stimulation. Deploying lead anchor. Once paresthesia is achieved with the lead, it is ready to be deployed. The reed covering the lead is pulled back, exposing the anchor. The stimulating end of the lead is now anchored. The loader is then removed while applying pressure to the skin over the stimulating end of the lead to prevent it from moving as the loader is withdrawn. Stimulation can be tested again at this point. If paresthesia has been lost, the lead must be removed and implantation must begin with a new lead. Inserting tunneling device. With the stimulating end of the lead anchored in place, a second 1 cm incision is made approximately 10-15 cm away from the first incision. 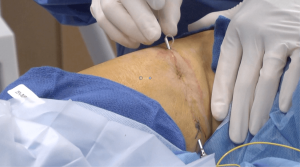 This incision will determine the subsequent placement of the EPT, so the location should be based consideration for the patient’s anatomy and comfort. Local anesthetic is applied to the path between the two incisions, and the tunneling device is inserted through the second incision to the first incision. The receiving end of the lead is placed in the end of the tunneling device and pulled through into place. Skin closure. Once the receiving end is in place, the incisions can be sealed with steri-strips or sutures. Figure 4. 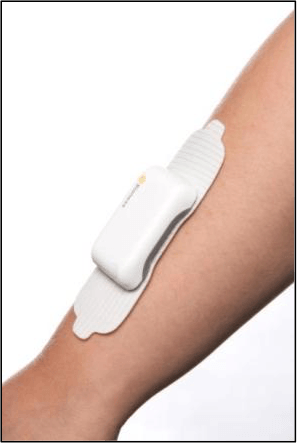 The Neuros AltiusTM cuff electrode. Figure 5. The Neuros AltiusTM implant placement in a below-knee amputee. In a study of ten lower limb amputees with chronic severe pain in the amputated limb, the Neuros Altius was placed on the sciatic nerve (for above-knee amputees) or tibial and common peroneal nerves (for below-knee amputees).8 Patients completed an average of four sessions of neurostimulation per week over a period of 3-12 months. Patients experienced at least 50% pain relief during 92% of the stimulation sessions. Four patients were able to discontinue pain medications. The pain relief produced from brief (10-30 minutes) HFAC stimulation, produced relief extending for minutes or hours after use. No safety issues were reported. Though randomized clinical trial data are required to draw firm conclusions regarding efficacy the efficacy of HFAC neurostimulation, devices such as the Neuros AltiusTM appear promising for relieving some types of nerve pain. Figure 6. 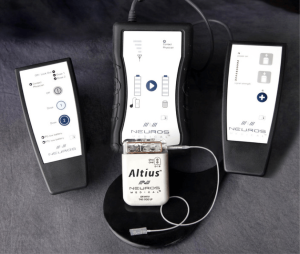 The Neuros AltiusTM High Frequency Alternating Current (HFAC) Stimulator. Many other recent neurostimulation devices have undergone similar miniaturization and changes to become less invasive. Though it does not target a conventional peripheral nerve, ElectroCore’s gammaCore® is a non-invasive vagus nerve stimulator (nVNS; see Figure 7). This device delivers electrical signals to the vagus nerve to treat primary headache.9 A microwave powered neural transmitter small enough to be injected via syringe has been tested in animal studies.10 This device consists of a 1 cm dipole antenna, 0.8 mm thick, with 1 mm platinum balls at each end. A microwave transmitter can deliver stimulation to these electrodes from outside the body. This device has been found capable of activating motor nerves through over 5 cm of tissue. Figure 7. ElectroCore gammaCore® non-invasive vagus nerve stimulator. Other advancements in PNS treatment may come from other therapies used in conjunction with PNS. For example, the use of regenerative treatments, such as stem cell therapy, in combination with PNS device implantation may offer advantages for certain patients. Recent research suggests that pulses of electrical stimulation can improve the viability of oligodendrocytes.11 The use of neurostimulation after the transplantation of mesenchymal stem cells led to greater functional improvement in patients with spinal cord injury than stem cell therapy alone.12,13 Additionally, autologous injections of platelet rich plasma (PRP) have been found to reduce the risk of infections when injected during spinal implant surgeries.14 This may be due to the fact that, in addition to its potential healing properties, the platelets concentrated in PRP also contain anti-microbial proteins (e.g., β-lysin).15 Given the potentially serious consequences of infections during procedures such as device implantation, the use of PRP during implantation may be helpful for patients at greater risk of infection during PNS device implantation. Though current PNS devices can be effective in relieving pain, these devices face various limitations based on the size and weight of the implanted device and the need for invasive procedures to replace device components. Ongoing advancements in PNS devices, such as miniaturization, external device components, and new modes of stimulation (e.g., HFAC) will further enhance the benefits provided by PNS. Smaller devices can be implanted through less invasive procedures, reducing the risk of infection and other complications as well as the time required for implantation. Some implantable devices and those that remotely power the device may allow the treatment of pain in harder to treat areas, such as the head. The miniaturization of PNS devices can reduce recovery time and the discomfort caused by the device. New lead materials and designs, such as flexible leads, can reduce the risks of lead fracture or migration. Taken together, ongoing advancements in PNS devices have the potential to improve the safety, comfort, applicability, wide-spread use, and efficacy of PNS treatment. Strand NH, Trentman TL, Vargas BB, Dodick DW. Occipital nerve stimulation with the Bion® microstimulator for the treatment of medically refractory chronic cluster headache. Pain Physician 2011;14:435-440. Trentman TL, Rosenfeld DM, Vargas BB, Schwedt TJ, Zimmerman RS, Dodick DW. Greater occipital nerve stimulation via the Bion® microstimulator: Implantation technique and stimulation parameters. Pain Physician 2009;12:621-628. Burns B, Watkins L, Goadsby PJ. Treatment of hemicranias continua by occipital nerve stimulation with a Bion device: Long-term follow-up of a crossover study. Lancet Neurol 2008;7:1001-12. Deer TR, Pope JE, Kaplan M. A novel method of neurostimulation of the peripheral nervous system: The StimRouter implantable device. Tech Reg Anesth Pain Manag 2012;16:113-117. Deer TR, Levy RM, Rosenfeld EL. Prospective clinical study of a new implantable peripheral nerve stimulation device to treat chronic pain. Clin J Pain 2010;26:359-372. Hsu E, Cohen SP. Postamputation pain: epidemiology, mechanisms, and treatment. J Pain Res 2013:6:121-36. Bhadra N, Kilgore KL. High-frequency electrical conduction block of mammalian peripheral motor nerve. Muscle Nerve 2005;32:782-90. Soin A, Shah NS, Fang ZP. Update of pilot study on high-frequency nerve block for post-amputation pain. Paper presented at 19th Annual Napa Pain Conference; August 24, 2013; Napa, CA. Goadsby et al. Non-invasive Vagus Nerve Stimulation (nVNS) for Acute Treatment of Migraine: An Open-label Pilot Study, submitted to the 2013 AAN meeting. Towe BC, Larson PJ, Gulick DW. A microwave powered injectable neural stimulator. Conf Proc IEEE Eng Med Biol Soc 2012;2012:5006-5009. Gary DS, Malone M, Capestany P, Houdayer T, McDonald JW. Electrical stimulation promotes the survival of oligodendrocytes in mixed cortical cultures. J Neurosci Res 2012;90:72-83. Liu H, Yang K, Xin T, Wu W, Chen Y. Implanted electro-acupuncture electric stimulation improves outcome of stem cell’s transplantation in spinal cord injury. Artif Cells Blood Substit Immobil Biotechnol 2012;40(5):331-337. Wu W, Zhao H, Xie B, Liu H, Chen Y, Jiao G, Wang H. Implanted spike wave electric stimulation promotes survival of the bone marrow mesenchymal stem cells and functional recovery in the spinal cord injured rats. Neurosci Lett 2011;491(1):73-78. Donaldson DM, Tew JG. Beta-lysin of platelet origin. Bacteriol Rev 1977;41:501-513.